Now, before I start talking further about my impression of the Some By Mi AHA BHA PHA 30 Days Miracle range, let's just get ourselves familiar with the terms. First of all, AHAs, BHAs, and PHAs are acids that are known as the chemical exfoliator. They help remove dead skin and help new cells turnover in a more gentle way than a physical exfoliator; which is the more traditional kind that we've been familiar with for the longest time. Physical exfoliator includes the ones that use small grains (sugar, rice etc), and even face cleansing brushes (eg: like Foreo, and Clarisonic device). Although all are categorised as a chemical exfoliator, AHAs, BHAs and PHAs do have different characteristics and some are more suitable on certain skin type more than the other. Some common AHAs are Glycolic Acid and Lactic Acid. AHAs are able to help in treating sunburn, hyperpigmentation and reducing uneven skin tone. On top of that, it is also excellent for those with dry or mature skin as it can reduce fine lines, wrinkles and even scars. With a great 'moisture-locking' properties, AHAs may give your skin the radiance it needs while look plump and healthy. One thing to note is that AHAs are water-soluble, which means it is not able to do what BHAs can; which is to penetrate deeper into the skin. With oil-soluble molecules, BHAs are suited for those with oily skin. Pay attention to this if you are prone to acne, blackheads and milia (that white bumps under the skin). The most popular BHA currently is the Salicylic Acid. BHAs are able to penetrate blocked pores to reach the deeper layer of the skin into the oil glands. From there, BHAs are able to reduce the formation of spots as they will dissolve the mixture of sebum (oil) and dead skin under the skin surface. BHAs are also anti-inflammatory and can help soothe redness on the skin. PHAs are similar to AHAs in term of its function to break down the 'glue' that binds dull, and dead skin on the surface of the skin and make it detach. But with molecular structure difference, PHAs doesn't penetrate the skin as deep as AHAs. This means, by working only on skin surface without disturbing the delicate layer beneath, if your sensitive skin is known to be unsuitable for AHAs or BHAs, Polyhydroxy Acids might be a gentler option for you. It is also great for those with rosacea. If your skin does not have any problem with these acids, they can actually be used together. For example, using AHA and BHA together will help your skin better in combating acne, sun damaged and clogged pores. Exfoliation process of the skin will also be more thorough. This is because AHAs and BHAs have two major difference that with each other presence, they seem to be more 'complete'. Why? BHAs breaks down bonds between cells while AHAs cause the cells themselves to detach. To combine the use of acids, you can either alternate them each night routine or just get a product that contains both (or even all three of them) like the Some By Mi AHA BHA PHA 30 Days Miracle Range! Yeah, now you see where I am going with all of this right? LOL. Super important tips: ALWAYS use a sunblock if your routine contain AHA, BHA or PHA as they make your skin more sensitive towards the sun. 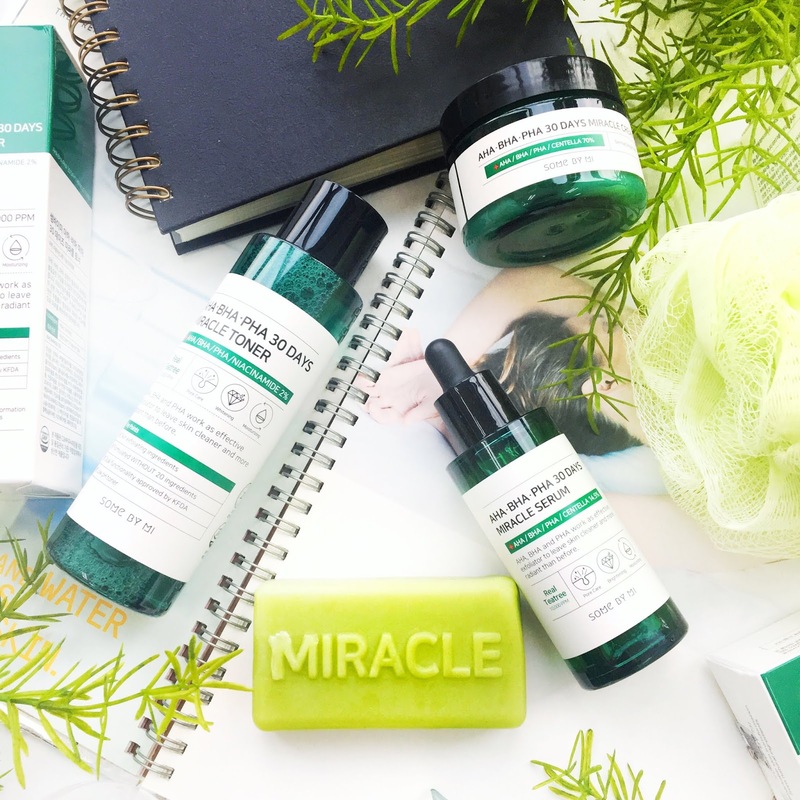 Some By Mi Malaysia kindly sent me all the products from the AHA, BHA, PHA 30 Days Miracle range including the cleansing bar, the toner, the serum and the cream. The cleansing bar, just like the other three products is said to be made of all natural ingredients. 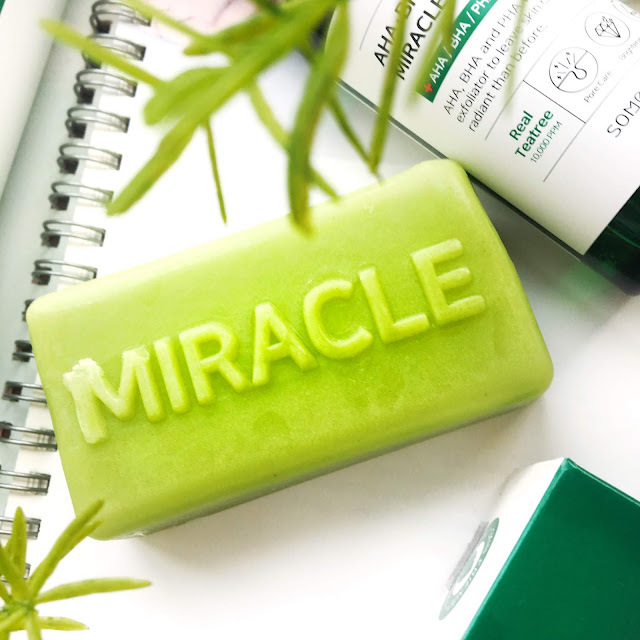 Works as an exfoliator to leave the skin cleaner and radiant, the AHA BHA PHA 30 Days Miracle Cleansing Bar from Some By Mi contains 10,000ppm of real tea tree, AHA/BHA/PHA/Niacinamide 2%, and 20 kinds of natural plants. With main functions to help with pores care as well as brightening (Niacinamide) and moisturising the skin, you can use the cleansing bar with bubble maker net that comes with it in order to make it foam up. It also contains Adenosine for anti-ageing. The cleansing bar is made with ECOCERT certified organic oil including olive oil and argan oil. It is also said to be free of any irritation-causing ingredient, so this soap should be gentle enough for those with a more sensitive skin. Also formulated with 20 natural extracts that are mild for you including Houttuynia extract, tea tree extract, green tea seed oil, Asiatic Pennywort just to name a few. I have started to use this soap daily for both face and my body. I noticed that I've been getting some back acne recently and with this soap, I am hoping I will be able to clear them out soon. It's probably hormonal but god I want it to go away so bad. For now, I would say that this product will last for quite some time since the bubble maker that comes with it can produce so much bubble in very little time. So far, my back acne seems to have calmed down a little. My guess its because of their healing ability thanks to the Salicylic Acid (BHA) in it. I will continue to use it and see if there are any more significant changes after 30 days. Unfortunately, the Some By Mi AHA BHA PHA 30 Days Miracle Cleansing Bar is a tad too dry for my dry skin (face area). I've tried washing my face with them but so far I don't enjoy the over-drying feeling I experience on my face every time. Conclusion so far, body use (OK), face application (too drying). The Some By Mi AHA BHA PHA 30 Days Miracle Toner is amazing! No wonder it has been receiving such good feedbacks over social media these past months. I actually have been eyeing to try this one out for so long, I was so happy I got offered to review it. Containing similar key ingredients with other products in this range such as AHA/BHA/PHA/Niacinamide 2%, this toner is free of 20 known ingredients that are harmful to the skin such as mineral oil and paraben. 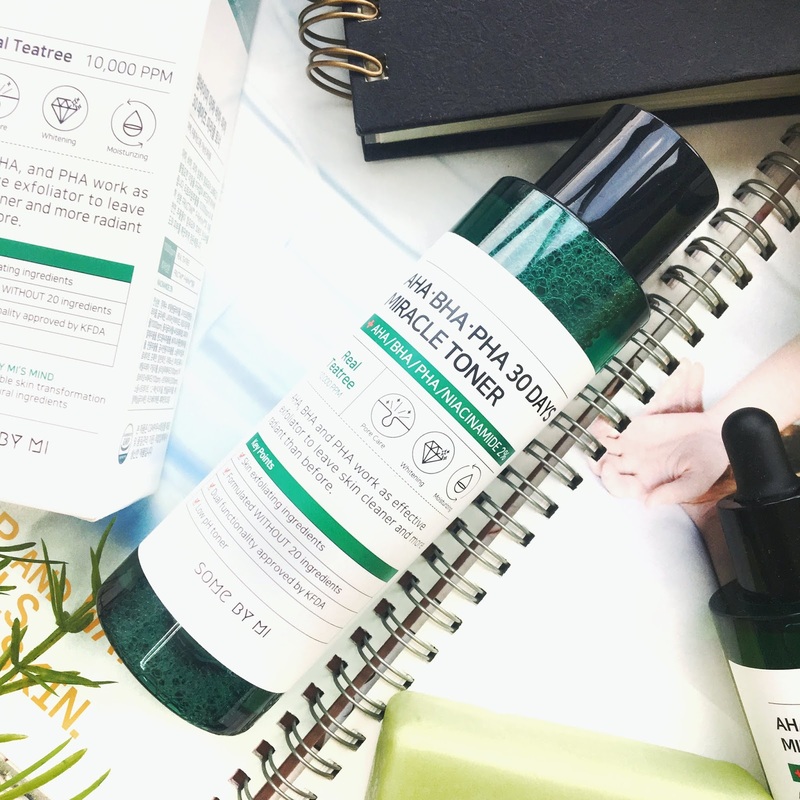 With a 10,000ppm content of tea tree extract, this toner is able to help your skin condition dramatically without irritation. 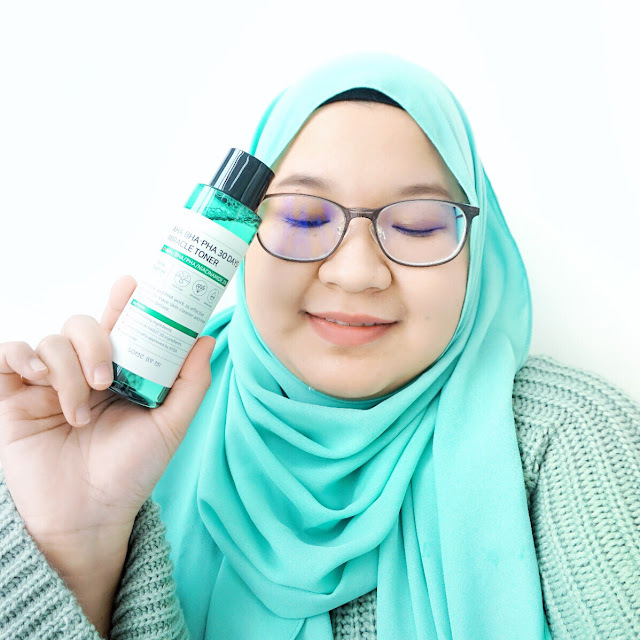 Also contains ingredients like Virginia Witch Hazel Extract (pore cleansing & dead skin removal), Papaya Extract (soothing, sebum control, lighten blemishes), Lentil Extract (skin protection & immunity), Swiftlet Nest Extract (antioxidant) and many more, this toner has a slightly acidic PH which can help calm 'alkaline skin' & rebalance skin PH in order to prevent breakouts and retain a healthy skin. Personally, I love how this light and non-sticky the toner is. Some toners are too strong & cause stings on my skin but I don't feel anything like that with this one. It also has a nice almost minty, medicated scent. I think I can see why people love this product very much & I can't wait to see if there will be more improvement on my pores after using this on a longer period of time. 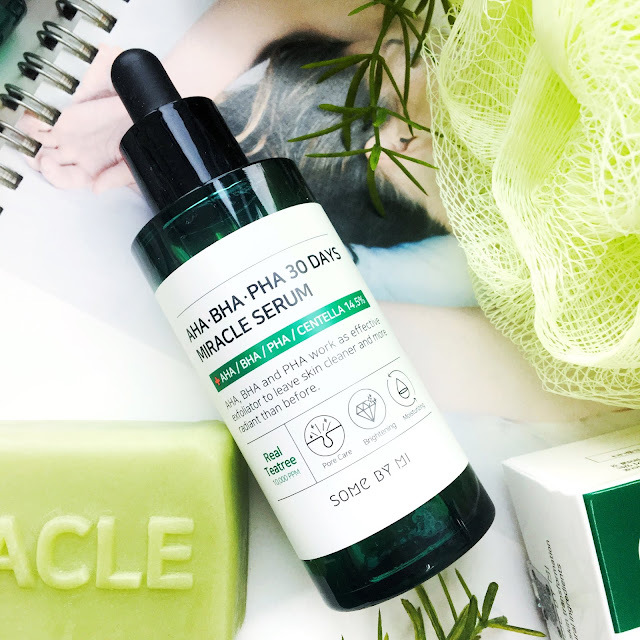 The Some By Mi AHA/BHA/PHA 30 Days Miracle Serum is ought to be one of the lightest and most watery face serum I've ever used so far. 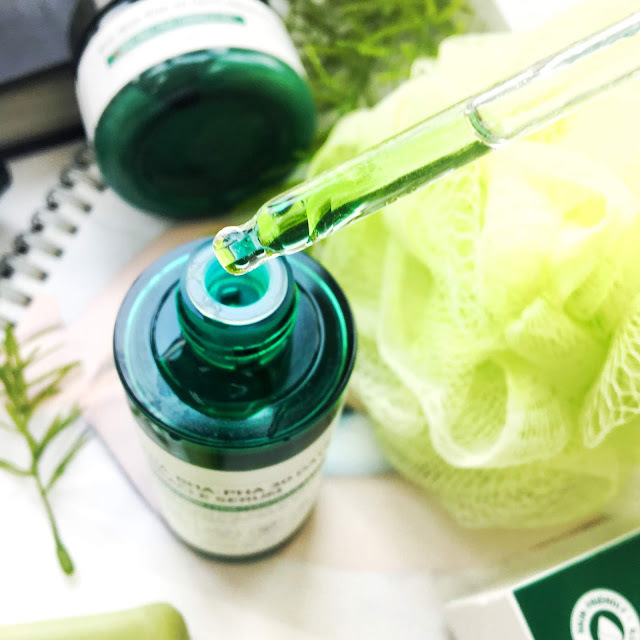 Added with 14.5% Centella extract along with 10000ppm tea tree extract, AHA/BHA/PHA, this serum is super great in soothing the skin. Every time I finished applying this on my skin, I can feel that it got calmer and less red than before. I also love how this serum smell. Unlike the other three that have more of herb-ish scent. the serum smells slightly fruity, almost citrusy (lime/orange/lemon-like scent). I actually made a mistake in the few first uses of this serum because I forgot to shake it. Keep it in mind that you need to shake the serum hard enough to mix the oil and serum together or else the serum will look clear just in the picture above. If shaken correctly, you will be able to see the oil parts mixed in the solution inside the dropper (like oil in soup haha). 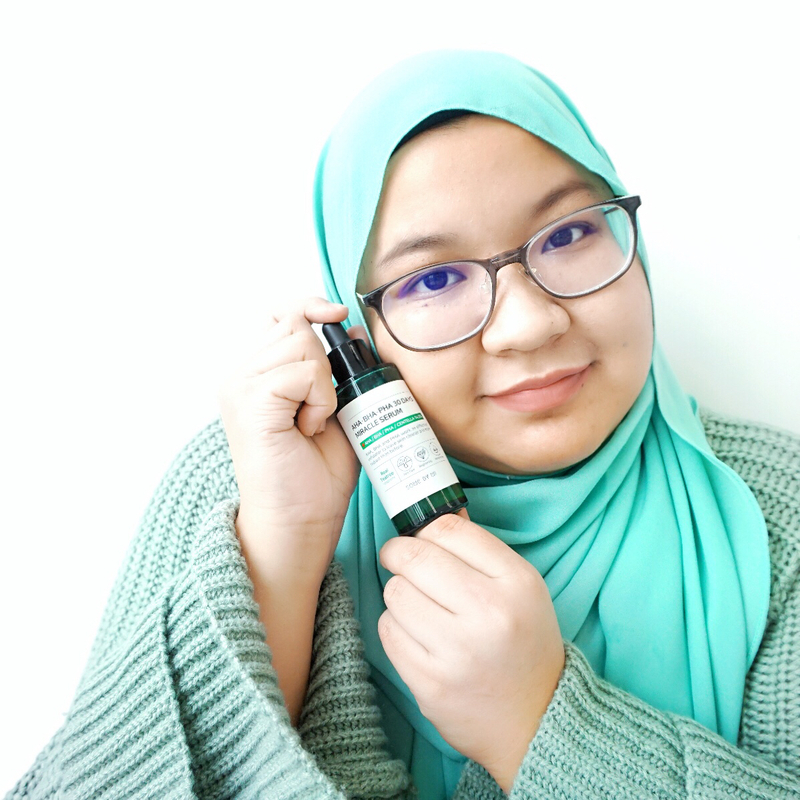 If the Some By Mi AHA BHA PHA 30 Days Miracle Toner is said to be the best selling toner in Olive Young (Korea drugstore) in 2018 so far (according to research I made online), I would say that the serum is probably the best in term of showing almost an immediate difference on my skin texture after application. It's my favourite out of the four so far despite both toner and the cream have been nothing but awesome products. It's just that the serum is able to make my skin feels so smooth & soft that I can't stop touching my face every time. The last product that I want to talk about is the Some By Mi AHA BHA PHA 30 Days Miracle Cream. 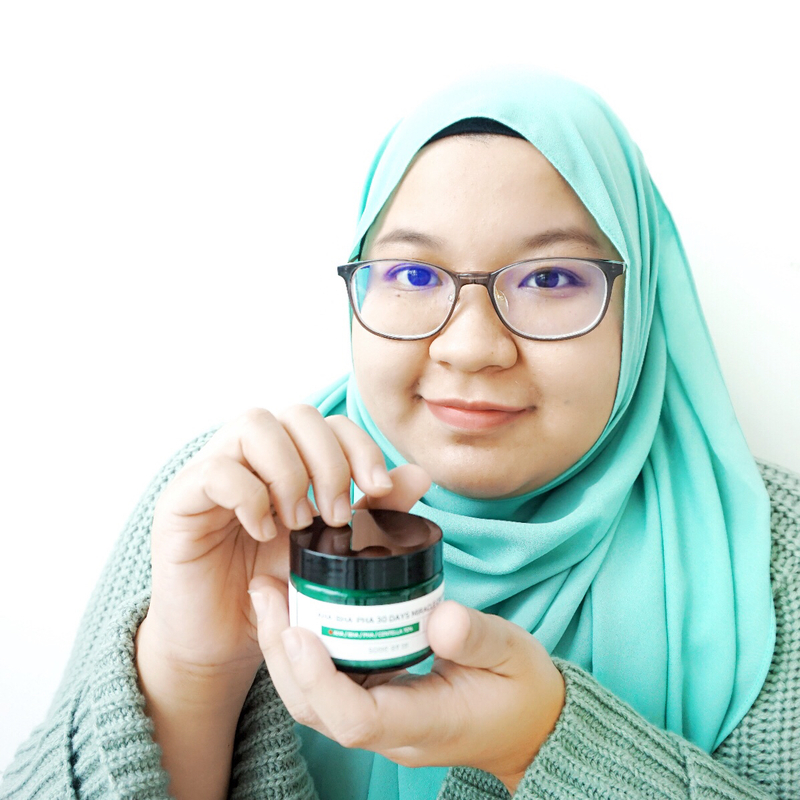 This cream helps with skin repair process, provide stronger skin barrier against outside elements that can be harmful to the skin while keeping the skin soothed and moisturised. When the skin barrier is weakened, our skin is more prone to issue like over drying, and redness caused by sensitivity. With weak skin barrier, our skin is also more likely to be more sensitive to germs and external irritants which may also lead to acne breakouts. 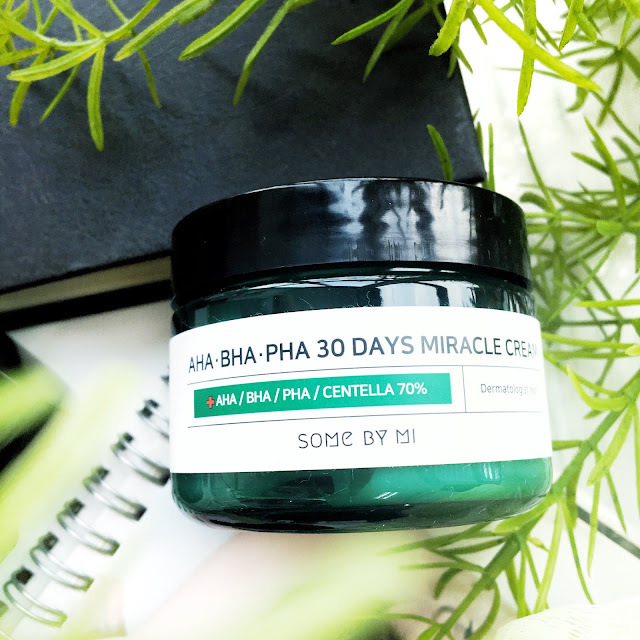 The Some By Mi AHA BHA PHA 30 Days Miracle Cream contains an even higher concentration of Centella which is at 70% compared to the serum. This equal to 700,000ppm of extract to help promotes wound healing on our skin! On top of that, this cream also contains 4-Circa Care which helps treat highly complex skin troubles with highly condensed and highly pure-powdered components including Asiatic Acid (skin barrier reinforcement), Madecasic Acid (damage care), Asiaticoside (soothing), and Madecasoside (anti-inflammation). Personally, I like a light cream that is hydrating enough for my skin and this cream fits that description. It's actually really light to be used by those with oily skin too. Tips: put the cream in your refrigerator for maximum cooling and soothing effect. I've been using the four products for about one week plus now so this post is more of a first impression review. 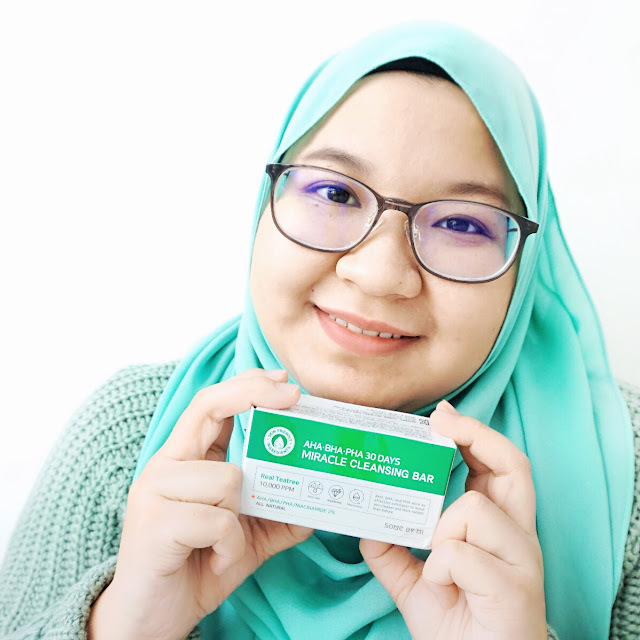 I will continue to use the products for 30 days to see if there is any significant change shown in my currently dry, flaky and sensitive skin. I might do a follow up post on this or just update it here. So stay tuned! The Some By Mi AHA BHA PHA 30 Days Miracle Range is available to be purchased via www.somebymi.my or www.kbeautyluxury.com. You may also visit KBeauty Luxury Facebook Page or Instagram @kbeautyluxury.my to learn more. They are also reachable through a phone call at 019 - 3873526.